Shahbazi, S., Askari, H., Mohamadi, A., Naseripour, T. (2014). Investigation of Mutation in Chitinase Gene in Gamma Radiated Mutants of Trichoderma Harzianum by STS Marker. International Journal of Advanced Biological and Biomedical Research, 2(Issue 4 (2)), 1-10. S. Shahbazi; H. Askari; A. Mohamadi; T. Naseripour. "Investigation of Mutation in Chitinase Gene in Gamma Radiated Mutants of Trichoderma Harzianum by STS Marker". 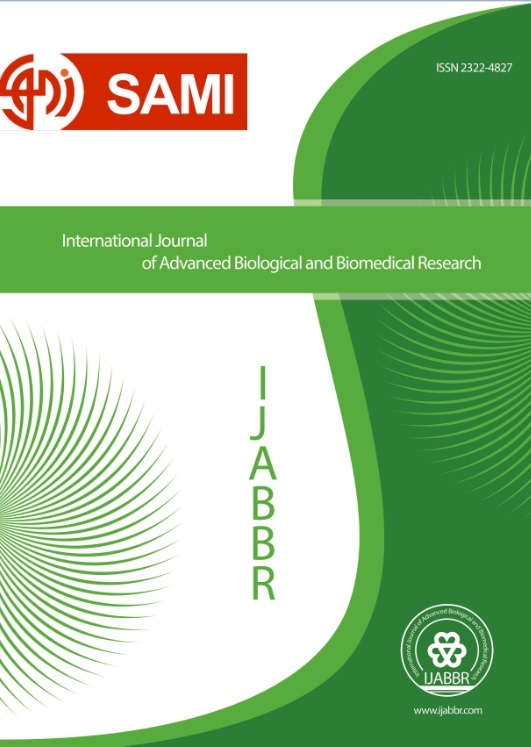 International Journal of Advanced Biological and Biomedical Research, 2, Issue 4 (2), 2014, 1-10. Shahbazi, S., Askari, H., Mohamadi, A., Naseripour, T. (2014). 'Investigation of Mutation in Chitinase Gene in Gamma Radiated Mutants of Trichoderma Harzianum by STS Marker', International Journal of Advanced Biological and Biomedical Research, 2(Issue 4 (2)), pp. 1-10. Shahbazi, S., Askari, H., Mohamadi, A., Naseripour, T. Investigation of Mutation in Chitinase Gene in Gamma Radiated Mutants of Trichoderma Harzianum by STS Marker. International Journal of Advanced Biological and Biomedical Research, 2014; 2(Issue 4 (2)): 1-10. Effects of induced mutation via gamma irradiated with 250 Gy dose (in Nuclear Agriculture Research School- Nuclear Science and Technology Research Institute) on Trichoderma harzianum conidiaon chitinase activity by STS molecular marker have been evaluated in this study. Among 20 irradiated mutants which selected via improved antagonistic capability against Rhizoctonia solani, PCR amplified chitinase mutated genes with their nested primers produced different sizes of amplified regions between 500- 700 bp, which showed polymorphism in compare with control (non-irradiated) isolate. Dual culture test showed that, more than 93% of mutated isolates have statistically more antagonistic capability against R.solani than its parental isolate, maybe resulted of enhancement in fungal cell wall degrading enzymes production. STS analysis data proved that in considerable mutants, induced mutation placed in chitinase gene. According to these results, bio-control capability of T. harzianum could be improved through gamma radiation.